Michelle is currently studying for a Masters of Engineering in Biomedical Engineering. She recently took part in the Made@City competition. 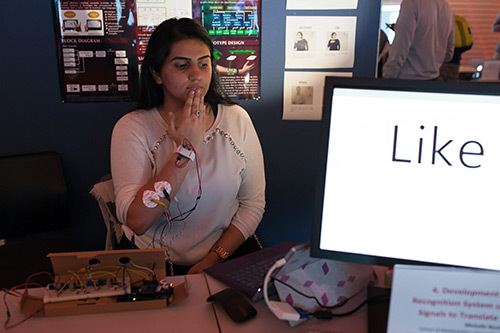 Michelle’s project outlined a method of designing and developing a device that would potentially be able to translate sign language into a spoken language. To achieve gesture recognition, myoelectric signals from the forearm were obtained, along with position and orientation data from an accelerometer and digital compass chip. The data was acquired through an Arduino board, then transmitted wirelessly to a laptop that processed the data and displayed the detected gesture. “I feel truly grateful for this recognition and would like to thank everyone who voted. I hope to continue to utilise my learning to support further development and enhancements in my project. Made@City was an incredible opportunity, it served as a great platform to present my project to the faculty and to my peers”. I found communicating to others about my project to be very satisfying and would say that was the best part other than winning. How did M@C help with your career prospects? Presenting at the event led me to meet many new faces, from both the university and local companies. Along with networking opportunities, it also provided a relaxed platform to help practice my presentation and communication skills. Tell us a little about what you are doing now. I am currently completing my 4th year and will be graduating, upon completion of this academic year, with a Masters of Engineering in Biomedical Engineering from City University. What would you say to students who are thinking of taking part in Made@City? After the long hours and immense dedication developing your project, to have an event to show off your hard work is immensely gratifying and rewarding. I would highly recommend participating in the Made@City event to all engineering students.